6000lb. 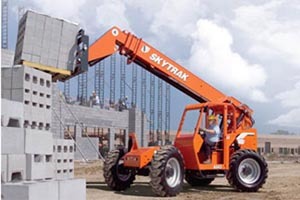 (2722 kg) max lift capacity and 36' 1" (11 m) max lift height. Easy accessibility to componentry for maintenance and service. Roomy comfortable cab with suspension seat and excellent all-around visibility. 3-speed power shift transmission for easy shifting a TRAK-Attach system for fast attachment changes.